Family Tree Maker 2010 for Mac was discontinued and replaced by Family Tree Maker for Mac 2 NOTE: Family Tree Maker 3 is the most current version. You asked for it and we listened. 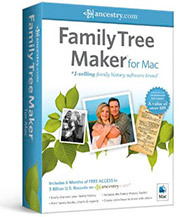 Announcing Family Tree Maker® Mac. If you’re on a Mac, you’ll soon be able to take advantage of the world’s best-selling genealogy application to create your family tree. Built on the functionality of Family Tree Maker 2010, the new Family Tree Maker Mac will offer invaluable features….